The Ticino watch company is an Asian-based producer of watches that represent ‘vintage watches that pay homage to classic models from years past,’ according to the company’s web site. The company has been in business for eight years and has a U.S. authorized dealer in the state of Florida called Sizzlin’ Watches. 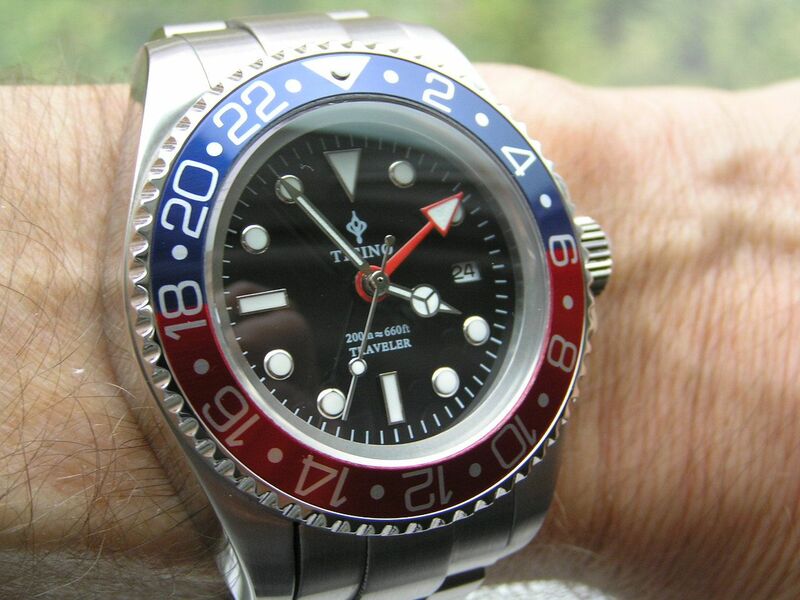 I became interested in the Ticino Traveler Diver/GMT because for one, I like dive watches as well as GMT watches and any watch that combines attributes of both designs is a winner in my book. Secondly, this particular Ticino intrigued me because of the overall homage-style look with some interesting details added to its design, especially the cool micro-adjusting clasp (more on that later). I appreciate the high-quality photography that Ticino presents on their web site, as it accurately represents what their watches look like and makes a purchase decision that much easier. 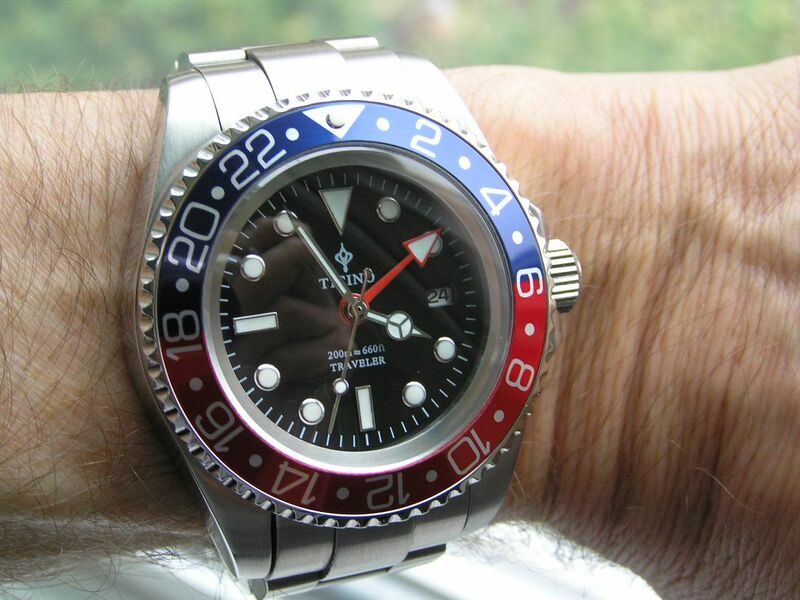 I contacted Rob at Sizzlin’ Watches and received a Traveler Diver/GMT a couple of days later, so kudos to him for the excellent service and prompt shipping. The Ticino Traveler starts with an impressive all stainless steel case with polished sides and brushed top. The overall watch has a great solid heft to it and feels very substantial, with large shoulders that help protect the crown. 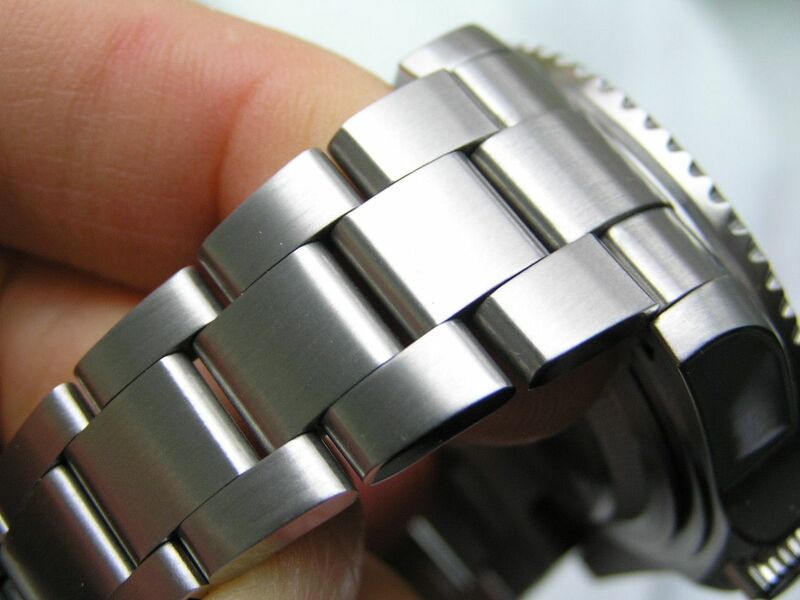 The Traveler measures 44mm without the screw down crown; 48.4mm crown inclusive. Thickness is a fairly robust 17.6mm. 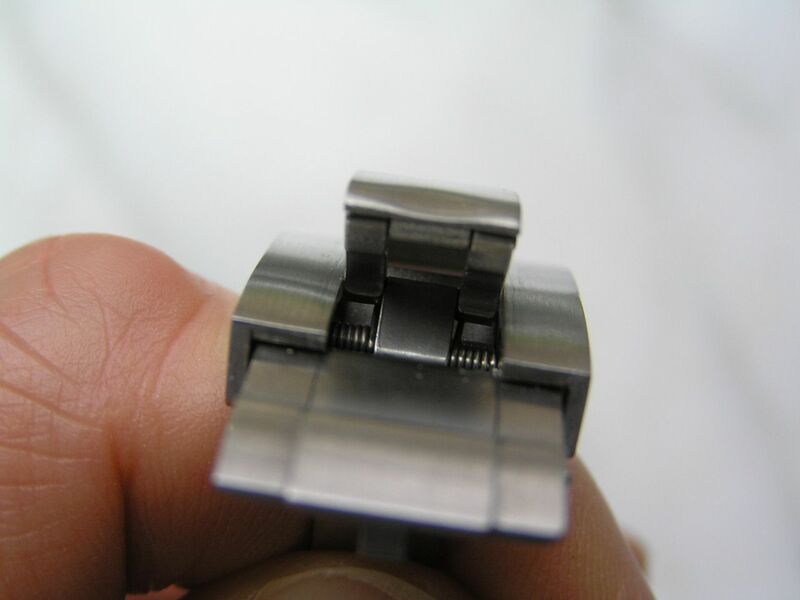 Lug spacing is 21mm and lug-to-lug, the Traveler measures 52.4mm. 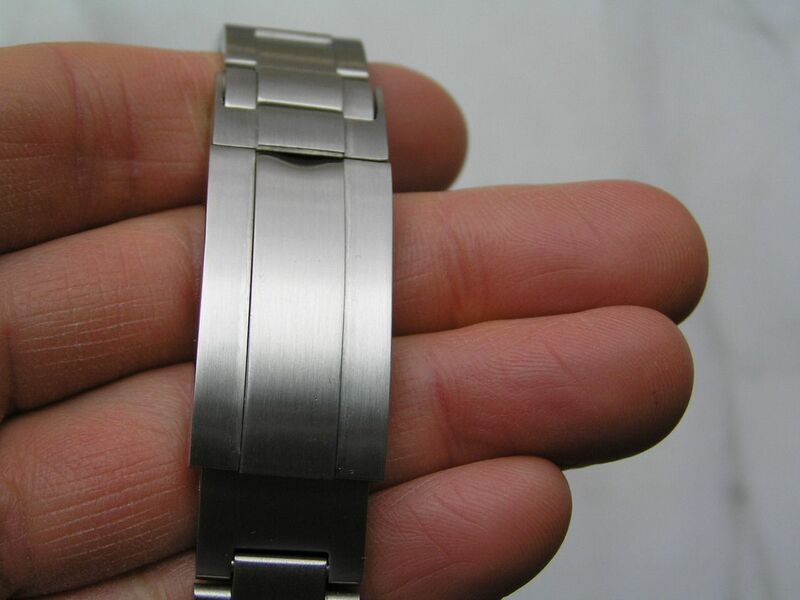 The lugs are somewhat on the short side, so the watch does not sit overly large on the wrist and despite it being a bit thick, it is not top-heavy. This is a large and robust watch but even a person with a thin wrist such as I have can pull off wearing it without a problem. The crown is unsigned, screws down with about 2-1/2 turns and is just about the perfect size at 8mm. I like crowns on the larger side because I like to wind my automatics prior to wearing them. 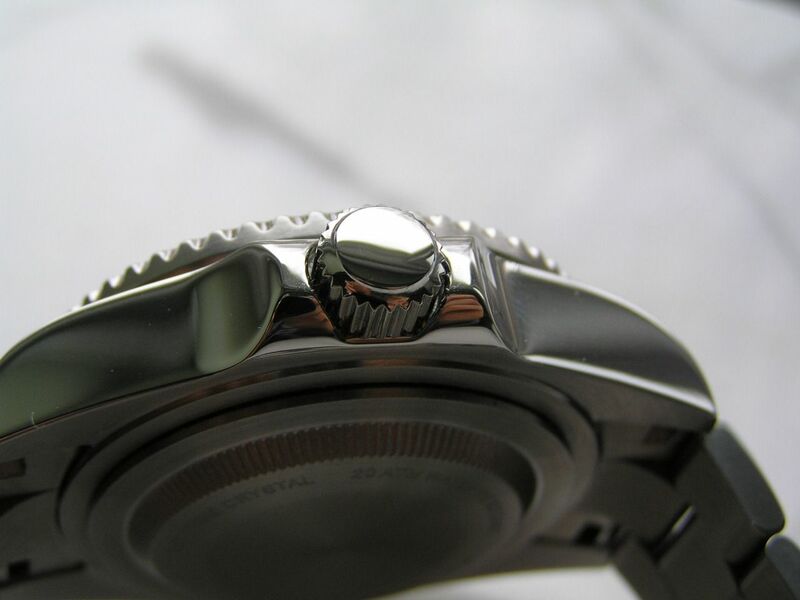 A larger crown also makes setting the watch easier and in the case of a screw down mechanism, makes is much easier to screw the crown down to the lock position. 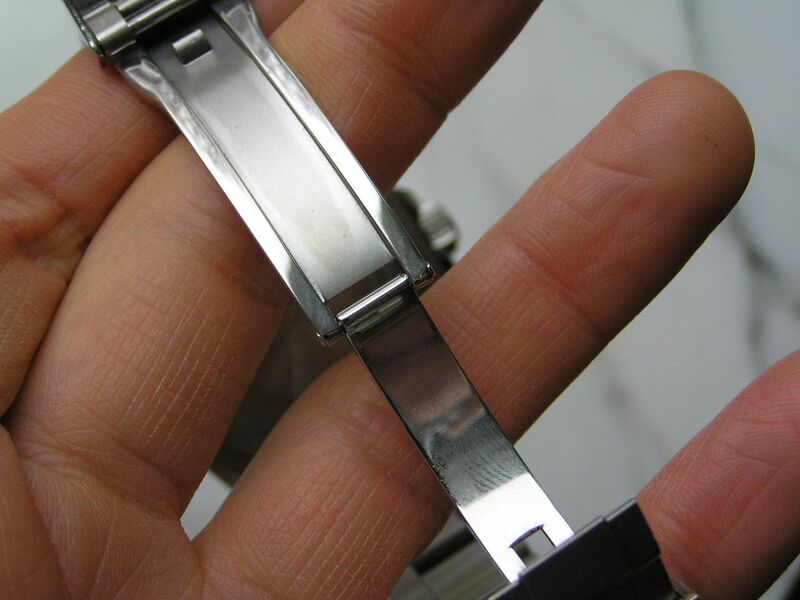 The caseback is brushed and screws down and is also slightly raised. 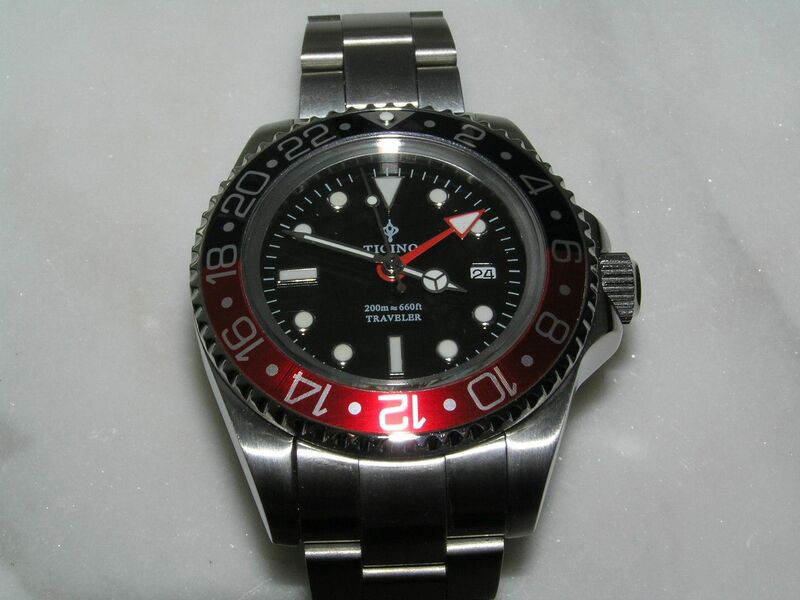 It has just has some watch specifications and the model name stamped into it. Nothing fancy, but purposeful and clean all the same. One thing that impressed me immediately about the Traveler is the overall quality of the piece. 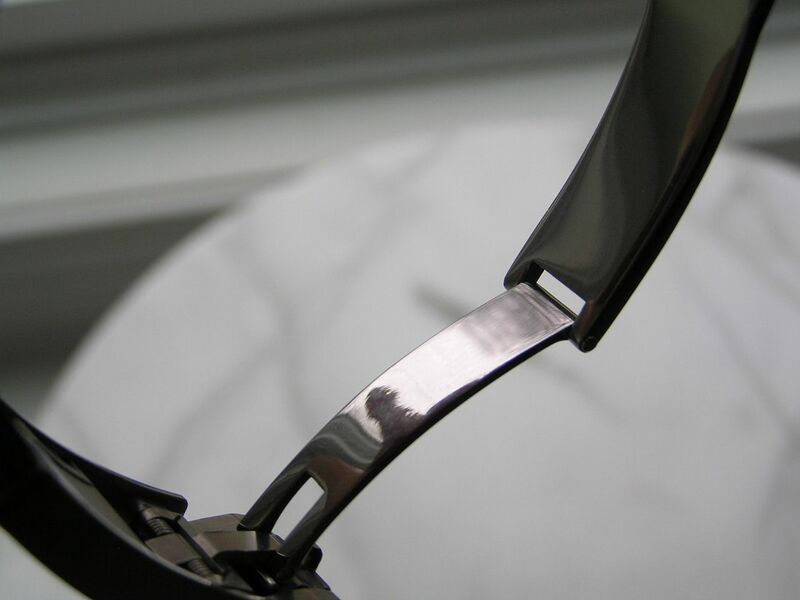 The polished sides of the case are mirror smooth and the brushed surfaces are evenly finished. The fit and finish are totally acceptable at this price point and would be acceptable at several times the price point as well. Nicely done! 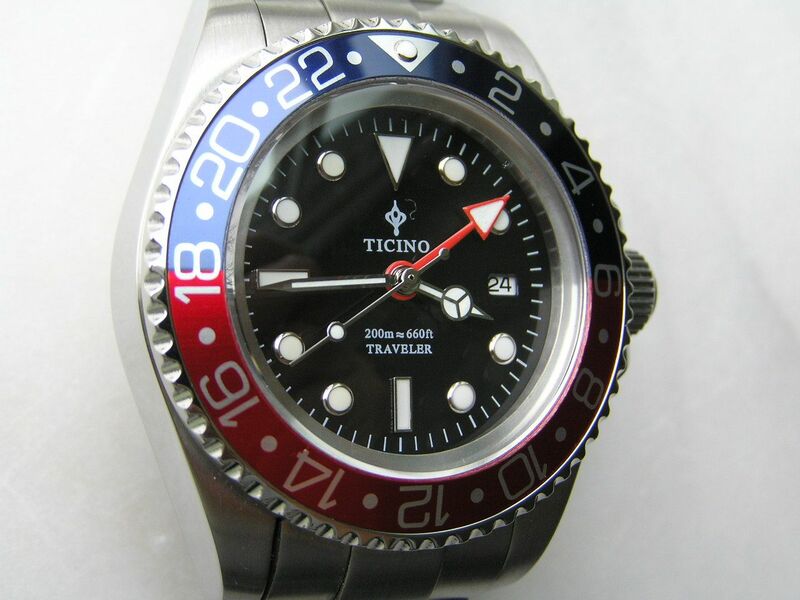 Since Ticino also considers the Traveler to be a dive watch, it is factory rated for 20 ATM/200 meters of water resistance, so getting it wet shouldn’t pose any problems. The dial on the Traveler is a deep black, referred to as ‘glossy’ in their description. It is glossy, but not overly so, it is just a near-perfect deep black color that gives the watch a rich look. Too many times lower priced watches fall down in the dial department, with cheap looking dials, off-colors or sloppy assembly. Not so with the Traveler. The dial exudes class and quality all the way. The hands are crisp and sharp, silver in color with white inset lume. 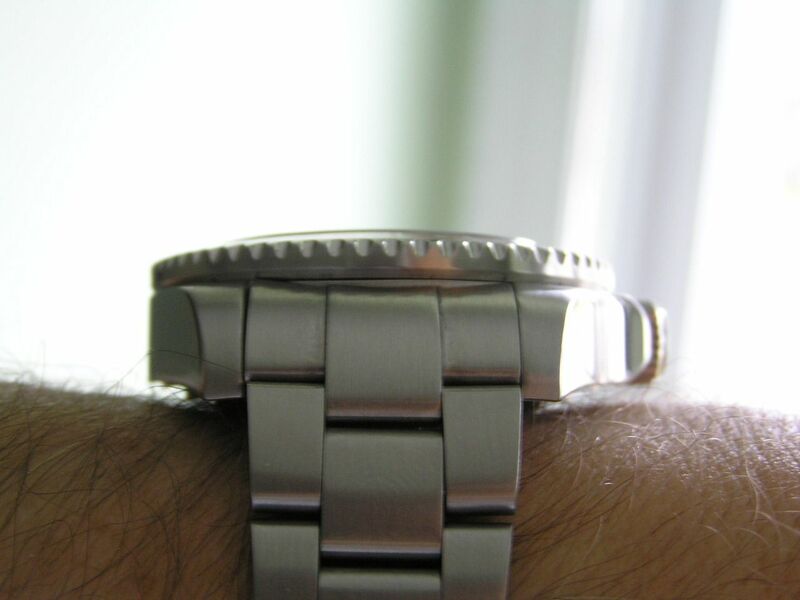 The seconds hand is silver with a lume ball about two-thirds of the way up. The markers are applied, rimmed in silver with white lume middles. An inverted triangle marker sits at the 12 position, with rectangular markers at the 6 and 9 positions and round markers at the 5 minute marks. 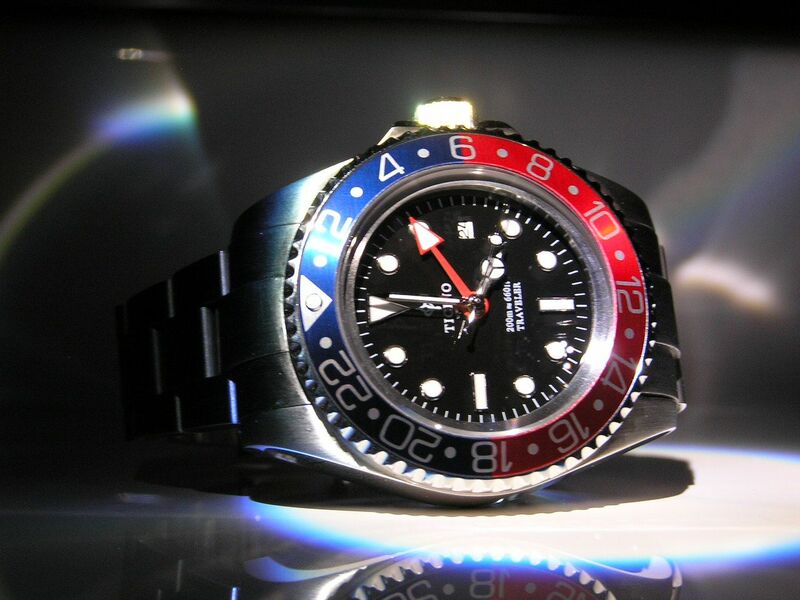 The independently adjustable GMT hand is red with a large lume arrow tip. And speaking of the lume, the hour, minute, seconds hand ball and GMT hand arrow tip glow a bright ice-blue, while the markers on the dial glow a more subdued shade of blue. 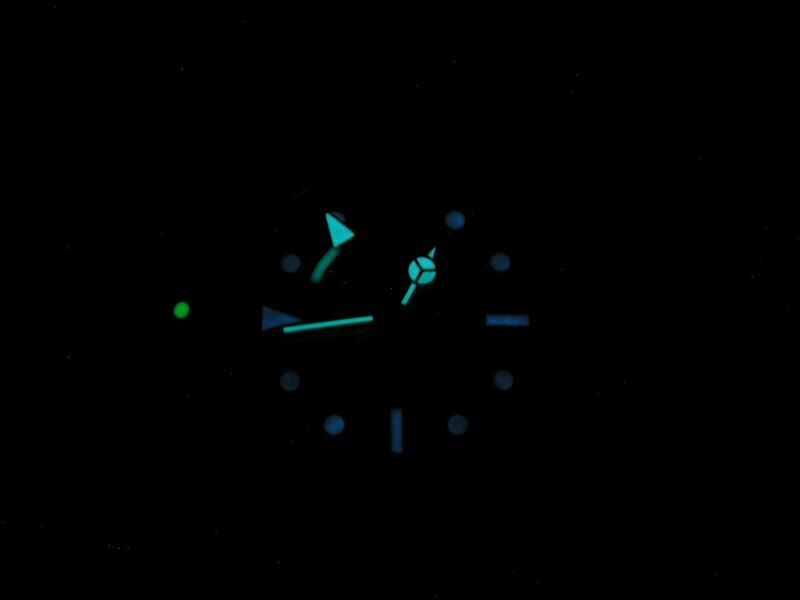 The lume pip on the bezel glows green. The lume of the hands is excellent while the markers could be brighter. There is a date window at the 3 position, with a black on white date wheel. The window could be a bit larger, since the date is a bit hard to read without a cyclops, but I am glad Ticino didn’t bother with a cyclops, as they can sometimes be too distracting on a watch. The date wheel could have a bit more even alignment, as it is about 97-percent centered in the date window, but not off enough to raise any real concerns. The dial has minimal printing, which always gets a gold-star from me. Below the 12 is a printed Ticino logo and the Ticino name. Above the six is ‘200m ≈ 660ft’ and ‘TRAVELER’. The dial is capped by a double domed sapphire crystal without any anti-reflective coating. The lack of any AR coating made the watch somewhat hard to photograph. Adding some AR would be a good move on Ticino’s part, but as is, the crystal is still a quality element. 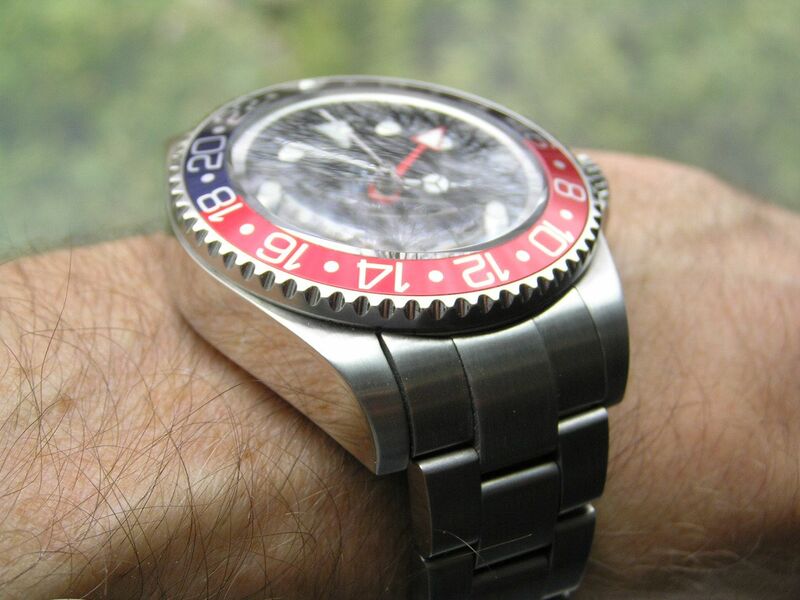 The GMT bezel is a 120-click unidirectional design, which is nice and tight and has no backlash. 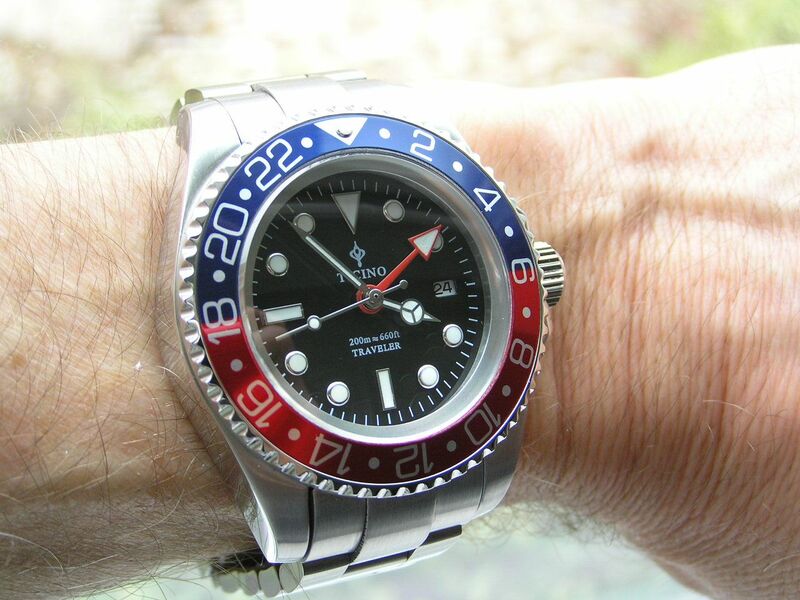 Having a unidirectional bezel on a GMT watch is a bit odd, as most GMT designs either have a fixed bezel (not so good) or a bi-directional bezel (preferred) which makes for quicker GMT adjustments. A small nit to pick here, but at least the bezel is very nicely machined and precise in its action. 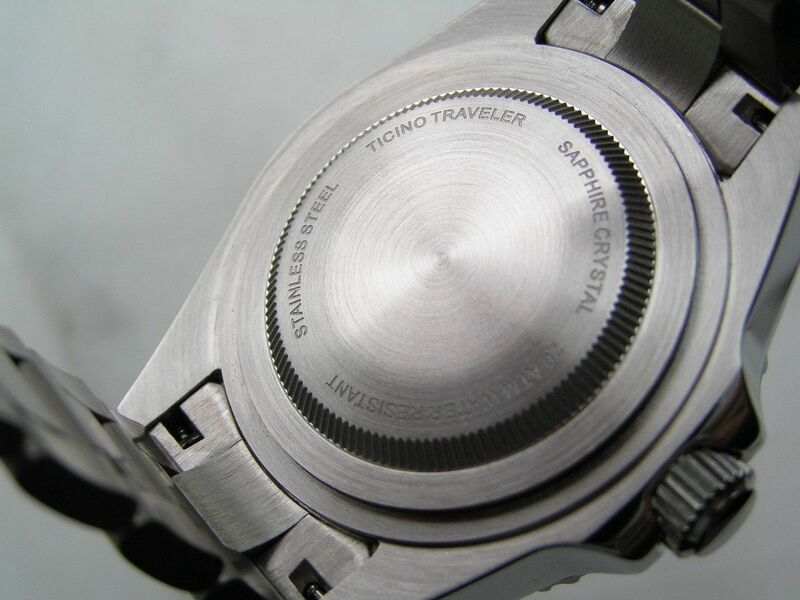 But since the bezel on the Traveler is adjustable, it means the watch can track three timezones at once instead of two, which means a lot to certain buyers. 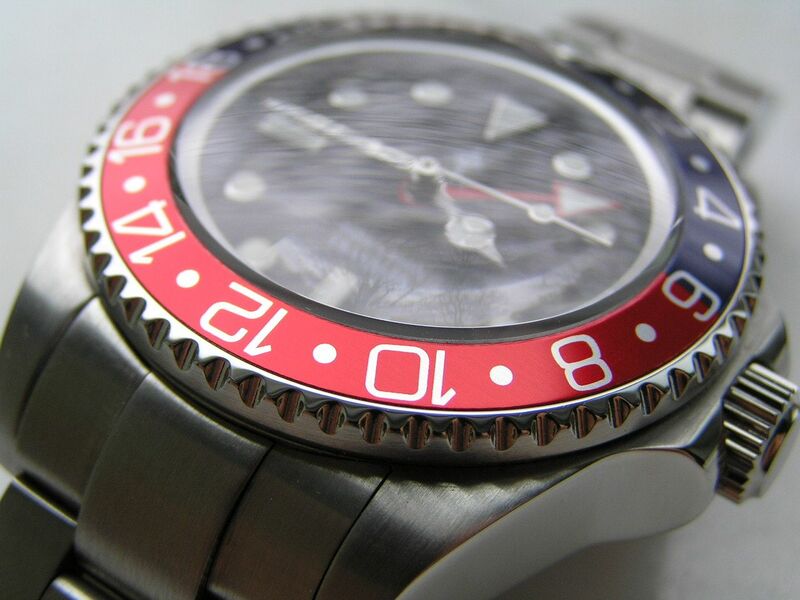 And speaking of the bezel, the red and blue insert (called a ‘Pepsi’ insert to most watch geeks) is the perfect shade of each color. The insert looks terrific and is easy to read. 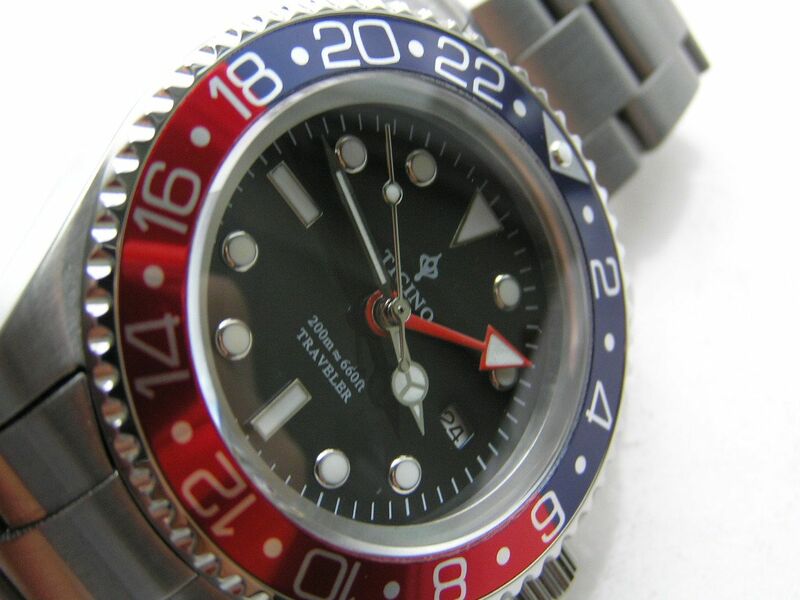 The top half is blue and the bottom half is red, with the 24-hour track indicated by silver arabics for the even hours and silver dots for the odd hours. A silver inverted triangle with lume pip sits at the 12/24 hour spot. Ticino makes a point of saying their watches are produced in a ‘clean environment’ and under my standard 8X loupe exam, this appears to be true. The build is nice and clean and the quality of the applied markers under magnification is great. Inside the Ticino Traveler is a Hangzhou 6460 automatic movement, which is a clone of the ETA 2836-2 modified for the GMT application. The movement runs in 25 jewels and beats at 28,800 vph. The watch winds and sets fine. 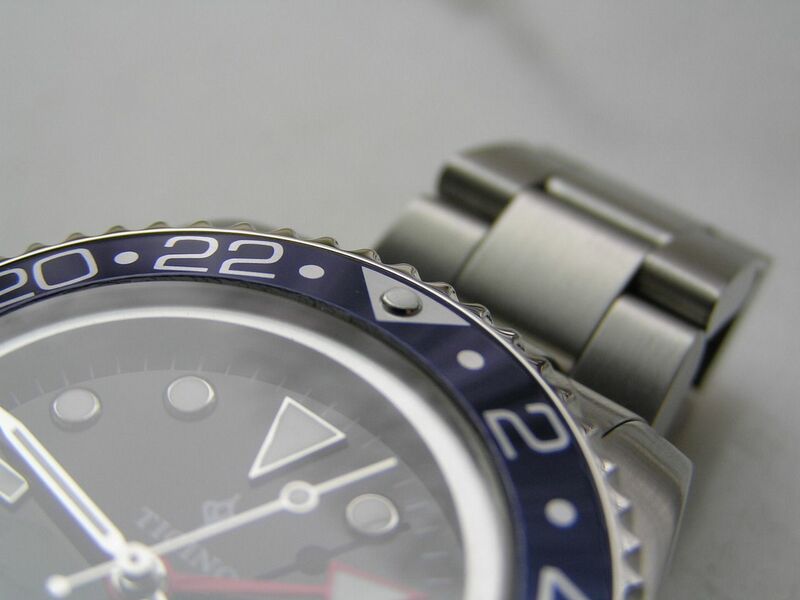 The GMT hands sets by moving the crown to the first click position and rotating the crown counter-clockwise. 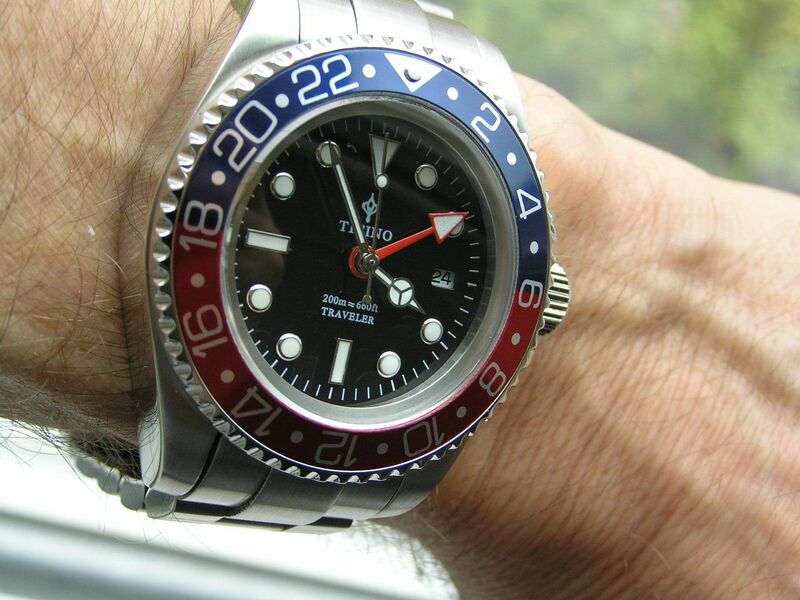 This moves the GMT hand counter clockwise around the dial to the desired position. 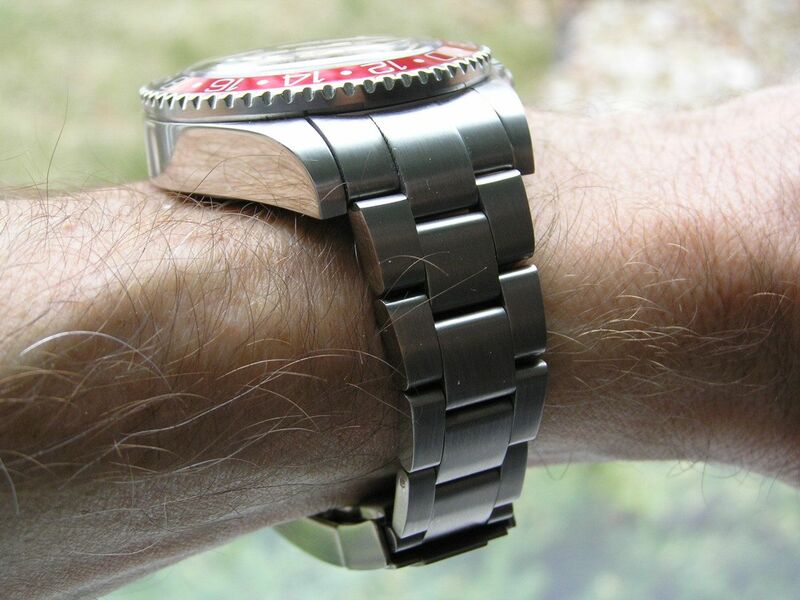 Alignment of the GMT hand to the desired hour is good. The date sets in the same crown position by turning the crown clockwise. 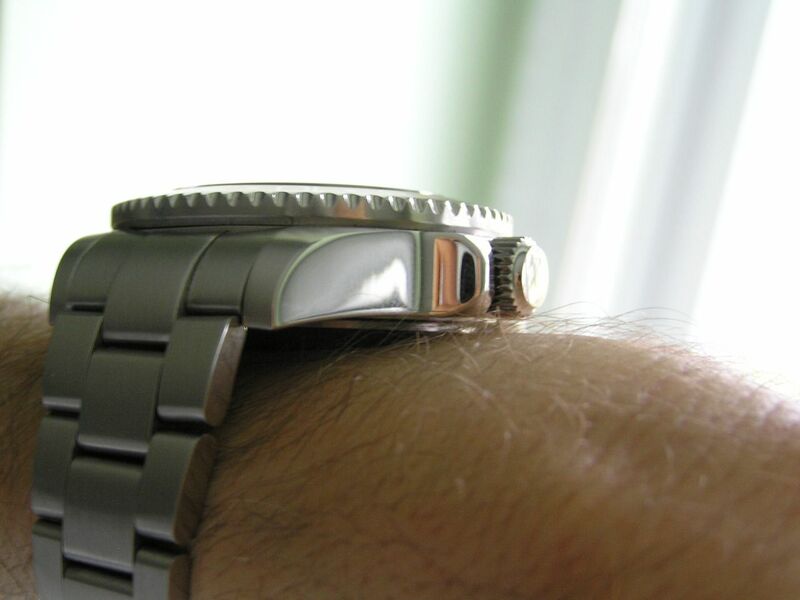 Hour and minute hand setting is accomplished with the crown in the second click position. During my testing, the Traveler ran at +15 seconds over 24 hours, in the dial/face up position. Power reserve was a good 41.75 hours. Overall, no complaints with the Hangzhou movement or time keeping functions of the Traveler and since this movement is based on the venerable ETA 2836 design, it should be a solid and dependable runner. 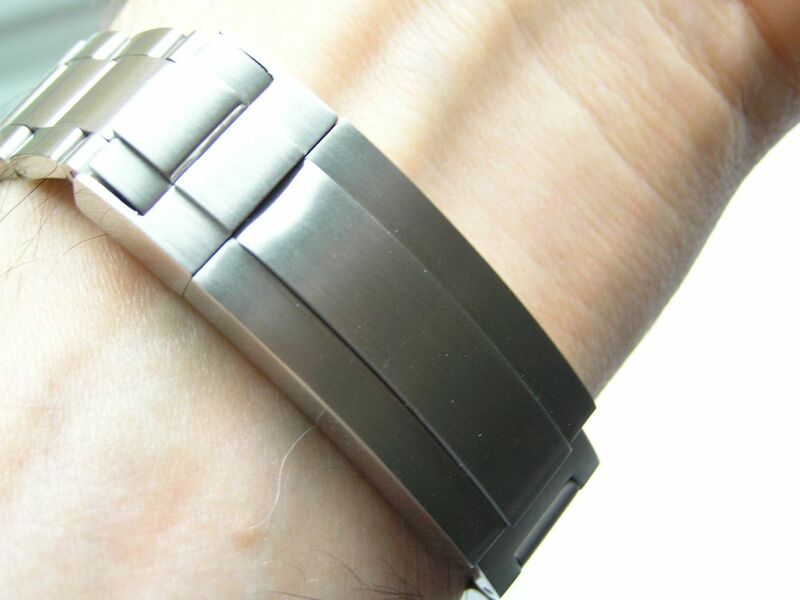 The bracelet on the Ticino Traveler is a solid link stainless steel Oyster style, with brushed links and polished edges. The end links are solid. The bracelet uses screws to hold the links together, so sizing presented no problems. The bracelet measures 20.8mm just below the end link and tapers to 15.8mm at the clasp. The clasp bears special attention, as it is a cool, nifty design that you wouldn’t expect to find at this price point. 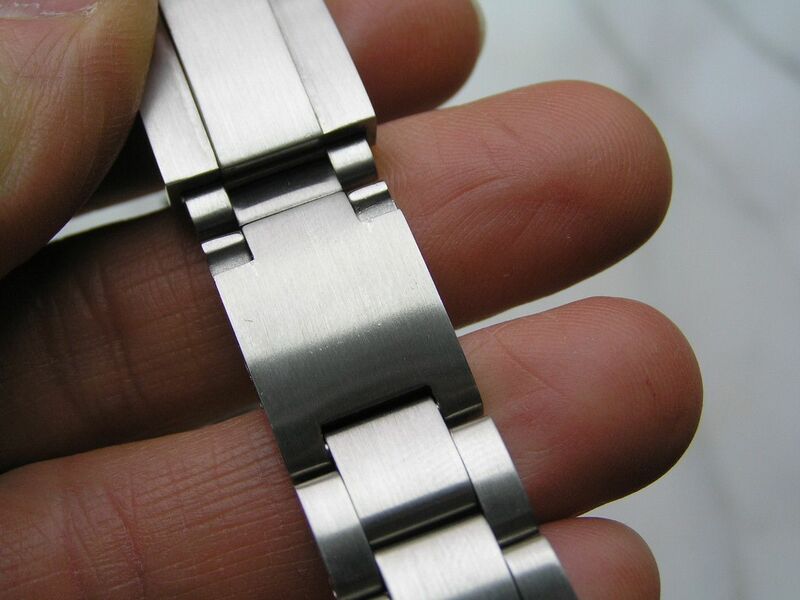 The clasp itself is a brushed fold-over type with polished edges and a flip-lock safety clasp. The deployant is machined and solid with a look and feel of a watch that costs much more. 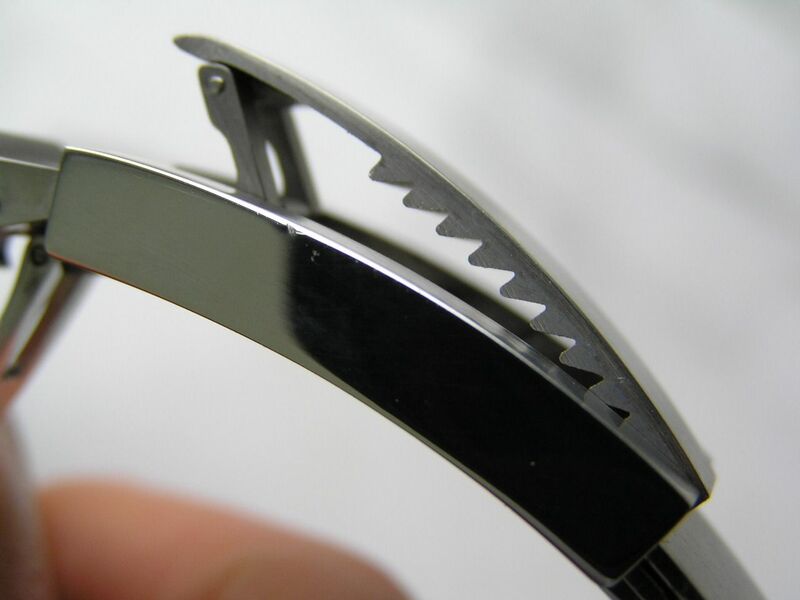 The neatest part of the clasp is the micro-adjustment or ‘glide-lock’ mechanism. 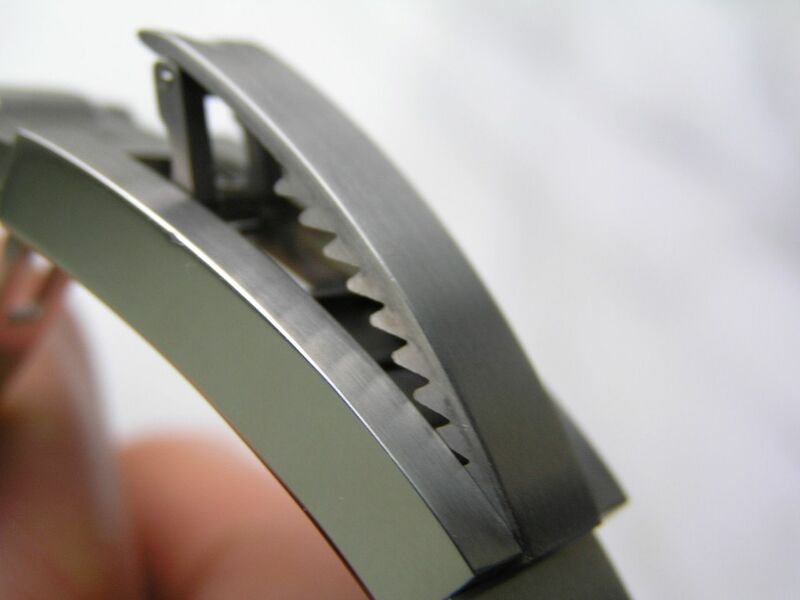 The center of the clasp lifts up the reveal a ratcheting mechanism. You simply lift up the center of the clasp and move the glide-lock to the desired position and push the center of the clasp back down. Doing this moves the part of the bracelet that is under the clasp in or out to achieve the proper fit. 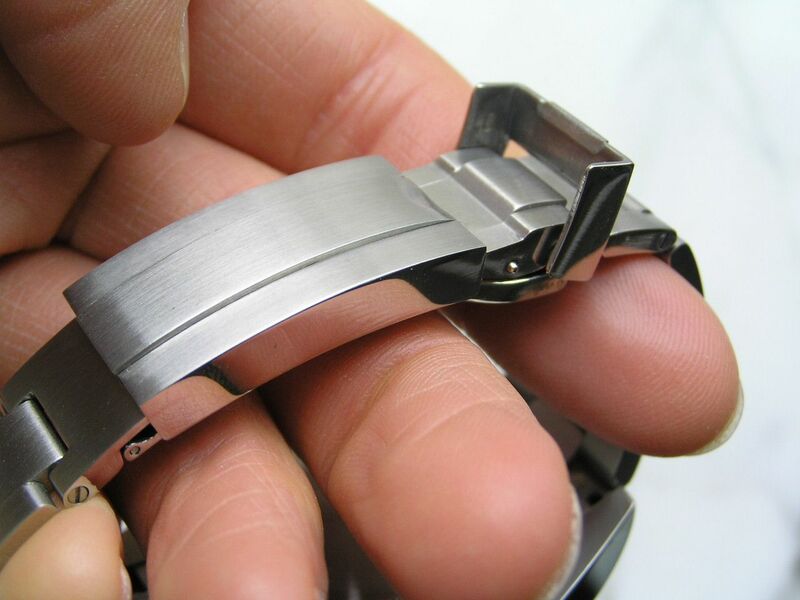 I find this mechanism superior to other glide-lock designs that have two clunky push buttons on the side of the clasp that crudely move the bracelet in or out. Hats off to Ticino for including a well-designed and cool glide-lock clasp on the Traveler. The clasp itself is a bit tight in operation, which is better than a too-loose clasp and it’s my hope that the clasp with work in a bit over time and become easier to operate. There is also a dive extension on the clasp, but it is very tight and hard to operate. The only real part where the Ticino Traveler falls down is in its presentation. A rather plain red box is all the watch comes in, without any documentation, just a warranty card. I would have appreciated an instruction manual, because since this watch has a GMT function, the user needs to know how to adjust the GMT hand and how to use the GMT bezel for tracking various timezones. Also, how the glide-lock clasp and dive extension operates should also be addressed. I will say that I have purchased watches at five times the price of the Traveler that came in similar boxes and truth be told, you don’t buy a watch for its box, so I can’t be too hard on the presentation, but I did want to make mention of it. Overall, the Ticino Traveler in an excellent choice in the vast sea of homage-style watches. 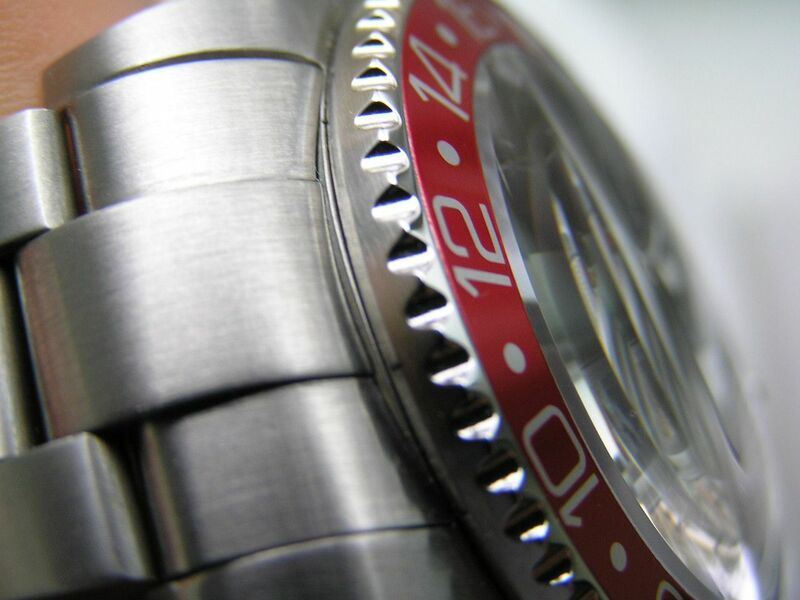 The diver and GMT functionality of the watch, along with solid build quality, interesting details and a price that is hard to beat make this piece a worthwhile addition to any collection. Verdict: the Ticino Traveler is a great watch that represents quality and functionality at a price point that makes it a no-brainer if you want a true GMT watch for your travels that can also double as a diver, whether it’s to points far away or just a trip to the grocery store. Well done! Thanks for reading and enjoy the pics.